One of the reasons why Venus looks like a jewel in the sky is that this sister planet of the Earth is covered by a dense cloudy atmosphere which causes its high visual albedo of 0.65. But this cloudy shell also completely frustrates any attempt to view the planet's surface features through optical telescopes. 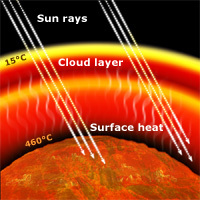 In the early years of telescopic observation, scientists believed that the clouds were made of water like clouds in the Earth's atmosphere and so they came to the conclusion that the conditions on Venus' surface were similar to the conditions which prevailed on Earth 250-65 million years ago in the Triassic, Jurassic and Cretaceous geological periods. With the help of spectroscopy we have known since 1932 that Venus' atmosphere contains carbon dioxide, but until fairly recently we did not know how much. 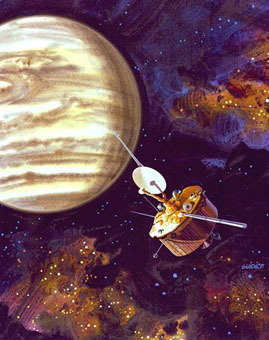 This situation changed in 1962 when interplanetary probes undertook missions to the second planet of the solar system. Today we know that the atmosphere of Venus differs remarkably from ours. 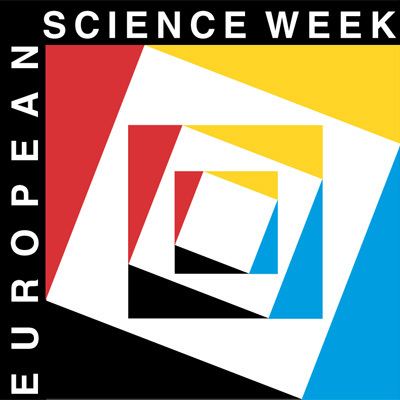 Unlike the Earth's atmosphere, which is mainly composed of nitrogen (78%) and oxygen (21%), Venus' atmosphere contains about 96% carbon dioxide, 3% nitrogen, some argon and traces of water vapour (varying from 0.1 to 0.4%), oxygen, hydrogen chloride, hydrogen fluoride, hydrogen sulphide, sulphur dioxide, and carbon monoxide. The surface pressure of Venus' atmosphere is about 90 times greater than the Earth's and its surface temperature is about 500°C, exceeding that of Mercury and hot enough to melt metals. Calculations indicate that such high temperatures require a mechanism in the Venusian atmosphere that traps solar radiation very effectively. This mechanism is called the "Greenhouse Effect" . That means that the carbon dioxide in the atmosphere is transparent to the light and heat coming from the Sun but it is opaque to the long wavelength infrared radiation coming from the hot planet. Since less than half the infrared radiation is released back to space, the result is to raise the temperature of the planet by a massive 500&deg:C. Compare this with the Earth, where the greenhouse effect raises the temperature by only 30°C. On Venus the temperature difference between the equator and the poles is only a few degrees. The effect occurs in all planetary atmospheres containing greenhouse gases. In the case of our planet Earth these are water vapour and carbon dioxide. The natural greenhouse effect is responsible for these planets being warmer than would be the case otherwise. However, under certain conditions that we find on Venus, we believe the greenhouse effect can "run away" . It will happen if the temperature rises near to the boiling point of water, because the oceans would then begin to change to water vapour which would increase the effectiveness of trapping heat and accelerate the greenhouse effect. When the oceans are gone, the atmosphere would finally stabilize at a much higher temperature and much higher density. Another runaway effect occurs when high temperature chemical reactions begin to drive carbon dioxide from the rocks into the atmosphere. It would also accelerate the heating. In the case of Venus we believe the initial solar heating prevented oceans from forming, or prevented them from remaining if they did form, and the subsequent lack of rainfall and the failure of plant life to evolve kept the carbon dioxide in the atmosphere rather than binding it in rocks as is the case for the Earth. So on Venus we see the greenhouse effect out of control and it is called the "Runaway Greenhouse Effect" . 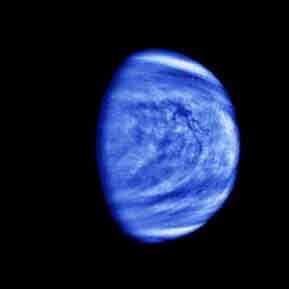 Venus is covered with clouds of sulphuric acid, rather than the water vapour clouds found on the Earth. At ultraviolet wavelengths cloud patterns become distinctive. In particular, a horizontal V-shaped cloud feature is visible near the equator. Ringing this latitude of the planet, the clouds whiz around at roughly 100 m/s, fast enough to orbit the planet in only four days. Winds also blow from the equator to the poles in large cyclones 100 to 500 km across. They culminate in two giant vortices that cap the polar regions. The direction in which atmospheric winds on Venus blow goes from east to west and from the equator to polar regions. The wind flow carries heat. Along with very effective atmospheric isolation, this flow helps to keep the temperatures fairly constant over Venus' surface, so that they vary about 10°C or less from the day to the night side and do not cool off much at night. The atmosphere appears to be relatively clear below the cloud deck that is located at about 45 km altitude above the surface. The yellowish-white clouds conceal what is below and their tops reach about 70 km above the surface - for comparison the highest clouds above the Earth reach only about 16 km. Although the atmosphere and clouds of Venus contain some water vapour, it does not amount to very much compared with the total amount of water on the Earth. If all the Earth's water (in both the atmosphere and oceans) were spread in a uniform layer over our planet's surface, that sheet would be 3 km thick. All the water in the Venusian atmosphere (none exists on the surface now because it is so hot) would amount to a layer only 30 cm thick. The Earth's surface and atmosphere have about 10,000 times as much water as Venus. Like the Earth a long time ago ? During its early history, Venus had relatively Earth-like conditions and substantial amounts of water. Venus' original atmosphere about 4 billion years ago is believed to have been much like its present atmosphere which is many times denser than Earth's and consists mostly of carbon dioxide. 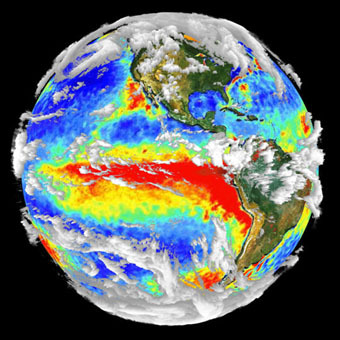 The "wet greenhouse" theory suggests that this enormous primordial atmosphere was reduced to a small part of its original mass by ocean-planet interactions. This would have left Venus' atmosphere about the same size as Earth's. The thin Earth-like atmosphere then lasted several hundred million years and eventual loss of most of its water would have stripped the planet of its water, leaving it bone dry as Venus is today.